Want to find out more about what comes after 4G? Paul Ceely, head of network strategy at EE is speaking on the subject of evolving beyond LTE on Day One of the 10th annual LTE World Summit, the premier 4G event for the telecoms industry, taking place on the 23rd-26th June 2014, at the Amsterdam RAI, Netherlands. In this interview we find out his views on the impact new technology such as NFV will make and how the carrier plans to maintain its 4G leadership. Do you feel any pressure for EE to be leaders in terms of network technology? Our ambition and vision is to build the best network and best service so our customers trust us with their digital lives. And to this end we see network technology and more specifically LTE and LTE-A as a way to maintain network leadership. Technology is evolving increasingly quickly, both on the user device side and the network, and so to maintain network leadership we must maintain technology leadership. Dr J W Byun, the CTO of SK Telecom, South Korea is speaking on Day One of the LTE World Summit, taking place on 24-26 June 2013 at The RAI, Amsterdam. Ahead of the show we speak to him about how SK Telecom has been able to extend its global lead in LTE and gives some insights into what he sees coming down the line for telecoms. SK Telecom is a leader in LTE technology and have been one of the first to go live with VoLTE? Why do you think you were able to do so when other operators have not done so? We were able to achieve nationwide LTE rollout at a rapid pace as Korea is a small but densely populated country. Moreover, Koreans are already used to fast Internet speeds and their expectations are getting higher and higher in terms of network speeds and device features/capabilities. As Korea’s top mobile carrier, SK Telecom has developed strong technological capabilities in mobile telecommunications and accumulated extensive knowhow in network operation over the past 29 years. Based on its long-standing partnerships with many telecommunications equipment manufacturers and device makers, SK Telecom was able to maintain its market leadership by developing the most innovative LTE technologies and securing the richest line-up of mobile devices. After launching Korea’s first LTE service in July 2011, the company saw its LTE subscriber base expand rapidly thanks to its premium service quality and customer care. With the spread of LTE, the company shifted its focus to developing and providing diverse services specially designed to match the needs of LTE users, allowing them to get the most out of the LTE network. In addition, on August 8, 2012, SK Telecom has launched the world’s first nationwide VoLTE service to enable users to experience premium-quality voice services. Are you also intending to be one of the first to pioneer RCS services and what impact do you think it will have on customers mainly using OTT services? 1) Enables joyn.T users to send free messages (SMS, MMS) to anyone including those who have not downloaded the joyn.T application. 2) Offers diverse differentiated features such as live video sharing and location sharing. 3) Can become interoperable with RCS services of other mobile carriers throughout the world. Where are you with LTE Advanced and carrier aggregation in particular? At Mobile World Congress 2013, SK Telecom showcased Carrier Aggregation using a smartphone for the first time in the world and we plan to commercialize LTE-Advanced by launching Carrier Aggregation (CA) in the second half of this year, using a combined total of 20MHz (from the 800MHz and 1800MHz bands). 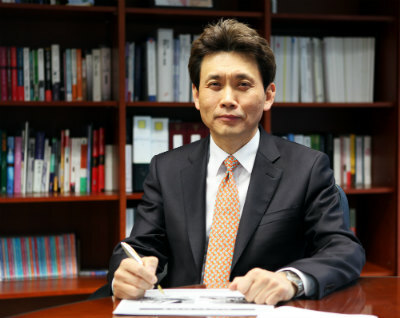 However, last year, in July 2012, SK Telecom became the first company in the world to commercialise Multi Carrier (MC) – a technology that enables operators to choose one frequency band from multiple carriers to provide more seamless and reliable LTE services at faster speeds – by building 1.8GHz base stations. Going forward, these MC-capable base stations can be easily turned into CA-capable equipment through software upgrades so as to support LTE-Advanced from the second half of 2013. RCS service sets itself apart from the traditional OTT offering through its unique features. It provides guaranteed Quality of Service (QoS) since it is offered over the managed IP network of the operators and hence is carrier-grade. In addition, it can be grown into a more comprehensive service with the addition of diverse features developed based on the global RCS standards. SK Telecom plans to add attractive features that are combined with communication services, such as HD Voice (VoLTE). Furthermore, as many mobile operators around the world are promoting the development of RCS services based on the same specifications, these services are expected to become a universal service that can be enjoyed by all customers around the world regardless of network and carrier. Is VoLTE part of your plans and what benefits will it bring both to operators and consumers? For customers, VoLTE improves voice quality over 3G voice calls by 40 per cent by utilising a wider bandwidth (50~7000Hz) compared to 3G voice calls (300~3400Hz) and Adapted Multi-Rate Wide Band (AMR-WB) codec, which handles 2.2 times wider frequency bandwidth than that of 3G voice calls. Moreover, the call connection time is less than 0.25 to 2.5 seconds, two to 20 times shorter than 3G voice calls. VoLTE also provides seamless conversion between voice and video calls. Moreover, VoLTE has helped mobile operators strengthen their competitive edge over third-party players, while paving the way for the creation of new and creative all-IP-based business models. Where do small cells fit into your plans, and what benefits will they bring? In the LTE-Advanced environment where data traffic is expected to increase dramatically, small cells will become the most crucial part of mobile operators’ strategy. Small cells enable operators to expand network capacity using their existing frequency resources in the most cost-effective manner. SK Telecom has deployed 50,000 femtocells including 3,000 LTE femtocells. To realize the true benefits of small cells, SK Telecom plans to develop and apply cell virtualization technologies such as Super Cell. Super Cell enables mobile operators to use cell virtualisation technologies to enhance network capacity by minimising inter-cell interference, ensure seamless call quality by removing handover, and benefit from cost-efficient operation of networks. Are there any other key innovations in your network compared to others operators? SK Telecom’s premium quality LTE service is supported by innovative LTE network technologies like Multi Carrier, LTE femtocells, Downlink CoMP (Coordinated Multi-Point) and SON (Self-Organizing Network), all of which were commercialised by SK Telecom for the first time in the world. The application of these advanced technologies, combined with SK Telecom’s long-established know-how and experience in network operations, is making the company’s networks even stronger, faster and smarter. The company is also making constant efforts to keep developing core LTE-Advanced technologies to lead the full-fledged opening of the era of LTE-Advanced. It has successfully demonstrated, for the first time in the world, core LTE-Advanced technologies like Enhanced Inter-Cell Interference Coordination (eICIC), Uplink Cooperative Multi-Point (CoMP), Carrier Aggregation (CA) and Transmission Mode 9 (TM9). Pricing for LTE is a controversial subject. Are operators getting it right? LTE operators around the world are introducing many different types of price plans for their LTE subscribers. As for SK Telecom, it is offering a wide variety of LTE price plans in order to meet the diverse needs of customers and to encourage them to experience the advantages of the ultra-fast network in the most convenient and cost-effective manner. They include flat-rate plans, specialised plans for different age groups such as the elderly and teenagers, and optional data-only plans. For instance, the company’s most recently launched (March 22, 2013) fixed-rate price plan named ‘T&T Sharing’ provides customers with unlimited intra-network voice calls as well as unlimited intra-network and inter-network texting. The company also modified its existing LTE data plans to lower the cost burden on customers by allowing them to add one data-only device to use the same data pool for free. Moreover, in January 2013, SK Telecom introduced the ‘LTE Data Gift Program’ that allows customers to give their remaining data to other LTE users through a simple process. How will affordable LTE roaming be achieved? LTE roaming costs are expected to become as affordable as that of 3G roaming through close partnerships between mobile carriers. This will occur as LTE services spread across the globe. Recently, the members of the Bridge Alliance reached a consensus that LTE auto-roaming takes an important role in the future direction of next-generation roaming services, thus calling for strategic partnerships between carriers around the world. After launching the world’s first LTE auto roaming service under partnership with Hong Kong’s CSL on June 1, 2012, SK Telecom has launched the service in Singapore by joining hands with M1 (October 1, 2012) and SingTel (March 1, 2013). Recently, SK Telecom has also started the service in the Philippines (April 1, 2013) by partnering with Globe Telecom. What are the biggest changes you see coming down the line for mobile telecoms? It has long been their dream of mobile operators to create mobile networks strong and smart enough to provide optimal network quality at all times. In the world of ever-increasing data traffic, they have been making heavy investments in their network infrastructure to prevent worst-case scenarios involving network overload. As a pioneer in the development of the global mobile industry, SK Telecom has already launched and refined its LTE network and is currently moving rapidly towards the era of LTE-Advanced. Along with its efforts to realise unprecedented network speeds, SK Telecom also plans to promote the development of the Software-Defined Network (SDN) and network virtualisation technologies to make its network more powerful and attractive. SDN and network virtualisation technologies hold great promise for mobile carriers and will have a huge impact on the industry over the next five years. With SDN and virtualization technologies applied to the existing mobile networks, operators will be able to significantly reduce their network investment costs as they can install a number of software services within a single system, and flexibly adjust the amount of resources needed for each of them. Moreover, they will be able to offer optimal network quality for a particular service being used by customers located in a highly-congested area.